Organizers encourage the Emory community to help fill the stands May 29-31 for the Special Olympics Summer Games, one of many events utilizing Emory’s campus amenities this summer. Photo by Rod Reilly. From a celebration of special athletes from across the state to a high-profile international youth poetry slam, summer will bring a stream of events and visitors to the Emory campus in the coming weeks. As Commencement crowds fade away, plans are gathering steam for a new crop of guests, drawn by a full roster of conferences, camps and special events, many with offerings that are open to the public. Coordinated through Emory’s award-winning Conference Services division of Campus Life, summer events are expected to draw about 10,000 attendees and ultimately serve multiple roles, according to Sherry Ebrahimi, director of university conference services. In addition to putting to use buildings and spaces that may otherwise lie quiet during slower summer months, “it’s a wonderful way to showcase our campus,” says Ebrahimi. “A lot of these programs on campus — from athletic camps run by coaches to pre-college classroom opportunities — are using this as an opportunity to recruit top students,” she says. 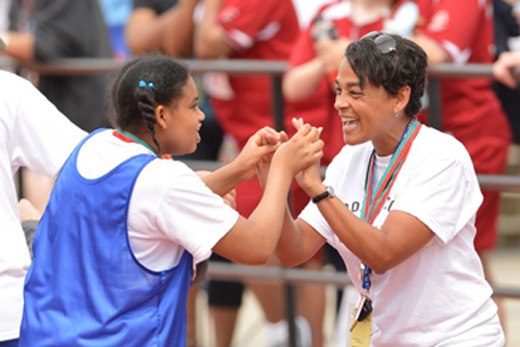 Some events, such as this month’s Special Olympics State Summer Games, “can be seen as a way to connect with and serve the community,” she adds, noting that the Emory community is encouraged to attend to fill the stands and cheer on athletes. “We’re also helping keep people employed through the summer months and providing a source of revenue while making good use of our facilities and resources,” she notes. Special Olympics Georgia 2015 State Summer Games, May 29-31: Some 3,000 athletes, coaches and guests from across Georgia will gather at Emory to compete in a full slate of athletic events, including aquatics, soccer, tennis, gymnastics and volleyball. The campus community is invited to attend the games, which are free and open to the public. Visit here for a downloadable information guide. Emory National Debate Institute Summer Camps and Workshops, June 7-19: The Barkley Forum, Emory’s award-winning center for intercollegiate competitive debate and debate education, hosts a series of summer debate camps and workshops for middle school and high school students. Hundreds of students will work with Emory faculty and students to hone their skills. For information, visit here. Castle Chess Camp, June 14-19: Top students and coaches unite for a week of intensive training and competition. Chess enthusiasts ages 9 and up will also have the chance to compete for $12,000 in prize money through the Castle Grand Prix chess tournament immediately following the camp. International Euphonium Tuba Festival, June 21-27: More than 200 guest artists, high school and college-aged players, and teachers from around the world will gather for a week of master class instruction, recitals and performance, with a public Gala Concert in Emerson Concert Hall at Emory’s Schwartz Center for the Performing Arts. The event is one of the longest-running festivals focused on the euphonium and tuba. Visit here for more information. Brave New Voices Festival, July 15-19: About 800 aspiring young poets from around the globe and their mentors will stay on the Emory campus for a festival that celebrates “voices of the future.” Highlights include workshops and public events, culminating with an international youth poetry slam. Opening ceremonies, which are free and open to the public, will be held Wednesday, July 15, from 6 to 9 p.m. at the Glenn Memorial Church. Additional writing workshops will also be held on the Emory campus. For more information, visit here. Viola da Gamba Society of America Conclave 2015, July 23-Aug. 2: “All the Colours in the Ayre,” the 53rd annual conclave of the Viola da Gamba Society of America (VdGSA), will bring 200 to 300 viol enthusiasts to Emory for a week of classes, workshops, informal playing and concerts. The society represents about 1,000 people dedicated to the viola da gamba (literally, “viol of the leg”), which come in many sizes, and its music, old and new.